There’s no denying it—the holidays are right around the corner. It’s time to start thinking about the gifts you’ll give, the meal you’ll make and the cookies you’ll bake. At 40NORTH Restaurants we think that warm cookies make the best comfort food. We serve our cookies baked fresh in a skillet with a scoop of your favorite flavor of churned ice cream. At The OFFICE Tavern Grill in Morristown we serve up three individual chocolate chip cookie skillets with three scoops of ice cream, talk about holiday cheer! If you want to give the gift of comfort this year, choose 40NORTH gift cards. Our gift to you is a $5 bonus for every $25 gift card you purchase! Give one of our gift cards with any of these holiday cookies and we’re sure you’ll be the star of the holiday gift exchange! You can’t go wrong when you combine chocolate, peppermint and marshmallow crème. Be sure to make extra batches of this extra-special recipe, because the cookies will go fast. They take some time—about an hour—to make, but you won’t be disappointed. What’s a holiday without gingerbread cookies? 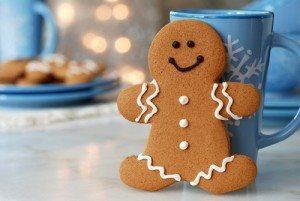 With this recipe, you can press the dough into decorative molds or cookie cutters—or turn it into gingerbread men. The delicious ingredients include dark brown sugar, molasses, ginger, cloves and cinnamon. The recipe makes two dozen five-inch cookies, which is plenty for your family and friends. These cookies are not only delicious—they’re beautiful. The cookies consist of a gingerbread border and candy “stained glass.” You can use fruit-flavored Life Savers, sour balls or similar hard candies. You can make your own designs—like a holly leaf—and turn this cookie into a tree ornament. These cookies look irresistible—essentially a chocolate cookie sandwich with a candy cane filling. Yum! The filling is made with crushed candy canes, of course, plus peppermint extract and red food coloring to give it a pink hue. The beauty of this recipe is in its simplicity—it only takes 20 minutes to make (about 10 minutes of prep time is involved).